Particularly when I'm traveling, I like to document my food. You can have very good food and very bad food while on a vacation. The November trip to California and BlizzCon/Disneyland was a case in point. My gastronomical journey began on November 3rd at O'Hare. I had to get up early to get to the airport in plenty of time to check in so breakfast wasn't going to be an option. Plus, I didn't like the idea of leaving dirty dishes in the sink for 6 days. 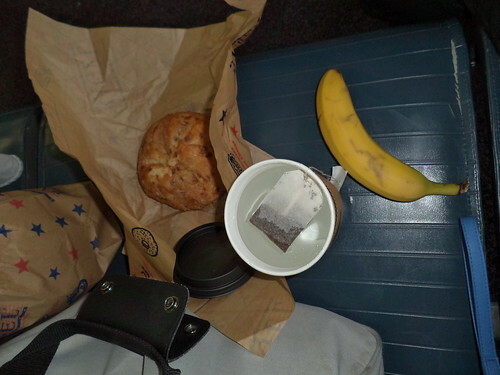 Breakfast was two muffins, a banana and hot tea from Great American Bagel, which was right across from my gate. My first airplane flight was in April of 1982. Back then, you still got free food with your seat purchase. As you know, that's no longer the case. I didn't eat the blueberry muffin before boarding so free tea and the muffin were food about 2/3rds of the way through the flight west. Upon arriving in California, there was little time to eat. I grabbed my luggage and found the Super Shuttle to my hotel. The trip to the hotel took an hour. Once checked in, I surveyed my surroundings. Liz wasn't to get in until 6:45. We had talked of meeting up with Sparrow and her hubby for a later dinner. It was now 2 and I hadn't eaten anything since about 10:45. As the shuttle drove down Katela, I noticed a little-seen restaurant in Chicagoland, IHOP. They have, for the most part, shuttered IHOPs in my area. It's sad but I know the one in Wheaton just could not keep servers. It's one of my favorite places to go and I miss it. So seeing one 4 blocks from the hotel was wonderful. I needed food. IHOP it was. 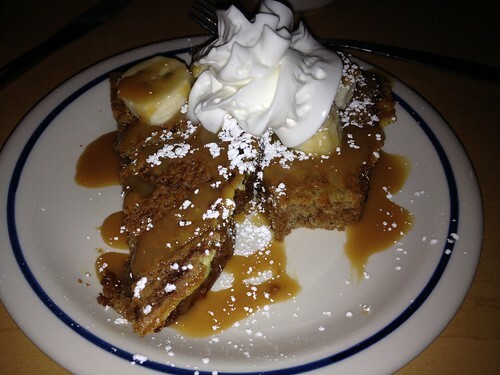 Pumpkin french toast with caramel sauce, sliced bananas and whipped cream. I was in heaven. There were other fall flavors which I thought about coming back to try, but the sheer number of places to eat in the area made a repeat visit impossible. I didn't realize how hungry I was. This is a half order. I had them bring out the rest of the order, it was so good. Liz's plane was delayed so adding that extra plate of french toast wound up being a godsend. 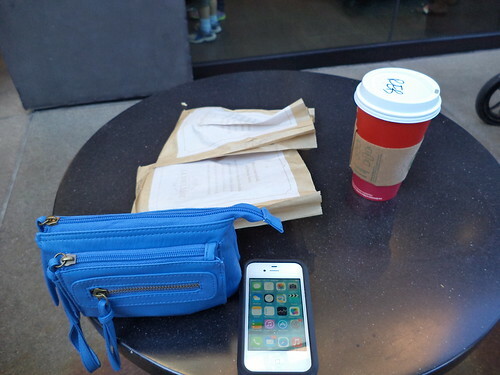 The next day, Thursday, November 4th, we wandered up to Disneyland. Our first stop there was a Starbucks; one of the largest I'd ever seen; for a quick breakfast. We had reservations for lunch, at 1, and the parks didn't open until 10, so there was some time to kill. I had standard fare of 2 blueberry scones (Delivered in separate bags. Talk about waste.) and hot tea. Liz and I walked around California Adventure the rest of the morning and headed over to Disneyland in the afternoon. We had reservations at Cafe Orleans. There are food carts everywhere including many which sold these. 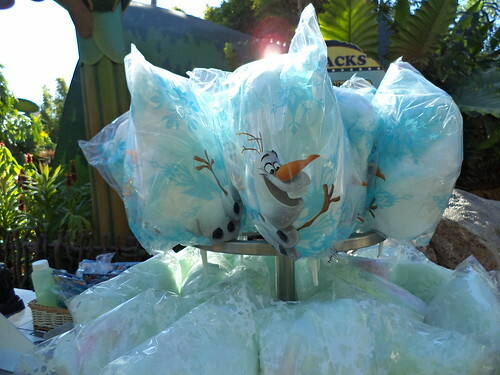 Leave it to Disney to turn spun sugar into something reasonably attractive. 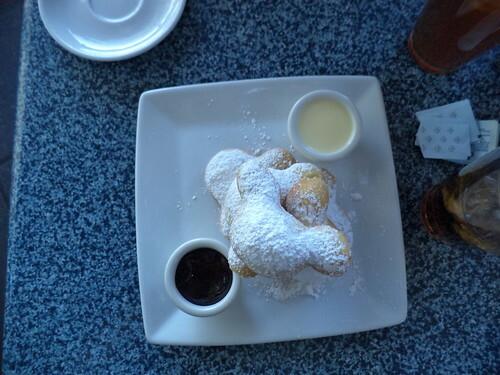 We went to Cafe Orleans for three things. #1 was the parmesan fries, in the basket at back. 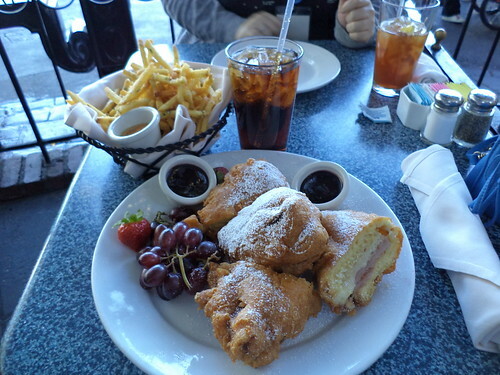 #2 is that Monte Cristo sandwich in the foreground. Liz and I split one sandwich. It was huge! It's served with the most amazing berry sauce. I don't remember the sauce the fries came with but I wound up just eating the fries "naked", they were so good. 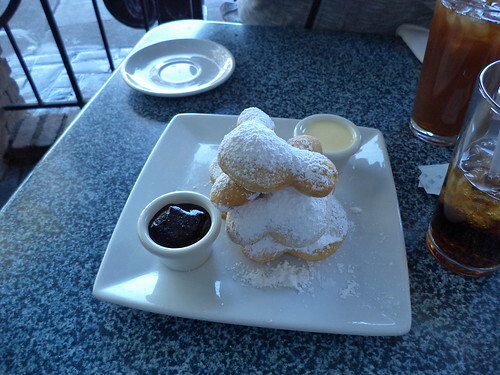 The main reason to stop was beignets. Incredible powdered sugar dusted puffs of air-inflated buttered dough. That's custard sauce at top and the mixed berry jam at the bottom. Oh my heaven. So...so wonderful. Even having a 6 block walk back to the hotel didn't leave us unfull. Too bad Cafe Orleans is inside the park. I'd consider eating there just because. I had not had a Monte Cristo in a very long time. In case you are unfamiliar with this sandwich, it is cheese, usually swiss, with ham or turkey, sometimes both, dipped in egg batter and fried. Some places will grill the sandwich but the best ones are encased in a thick tempura-type batter. A guild member told me to go get one while I was out there, to which Liz replied, "I made reservations. She WILL have one." The whole meal was stellar. Ashley arrived in the late afternoon and we went to get our convention badges. That evening, we met up with a guild member and her husband. I was still feeling full from lunch. We debated where to go for dinner and wound up back at Downtown Disney, the location of the Starbucks, for dinner at Rainforest Cafe. Now, I can take or leave Rainforest. There's one north of me, but we just couldn't think of a place in the area to go to with a wide menu and which wouldn't be crawling with BlizzCon people. We wanted to talk. We'd never met Amy and her husband so this was to be a special event. Fortunately, they have a decent a la carte menu. 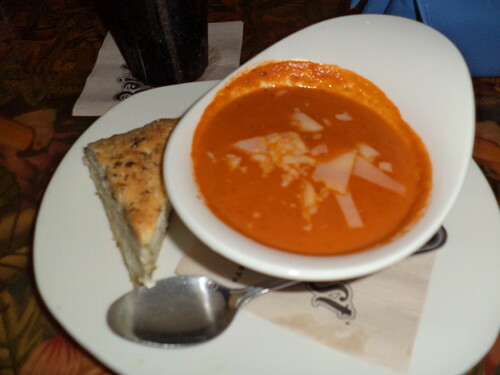 A bowl of creamy tomato soup, topped with gruyere, and served with spiced cornbread. With hot tea, it was all I needed. Friday started BlizzCon. 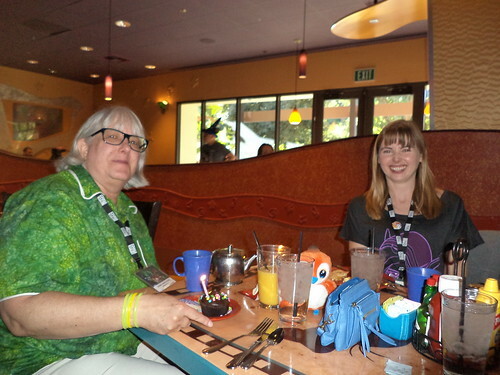 In order to be alert and on the ready, we went to Goofy's Kitchen for breakfast. Oh come now. If given a choice, wouldn't you trade a free hotel breakfast for this? That's their special peanut butter and jelly pizza. (I have the recipe.) 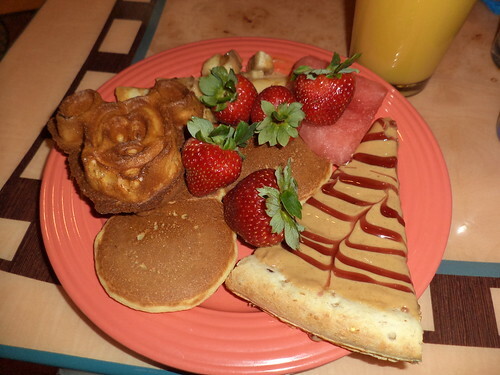 The Mickey Mouse mini-waffle at the upper left was not very good; hard and flavorless. Liz said, in all the years she's been coming to this buffet, this was the first thing that was a disappointment. Fruit was in abundance. I'll always go for the fresh fruit. 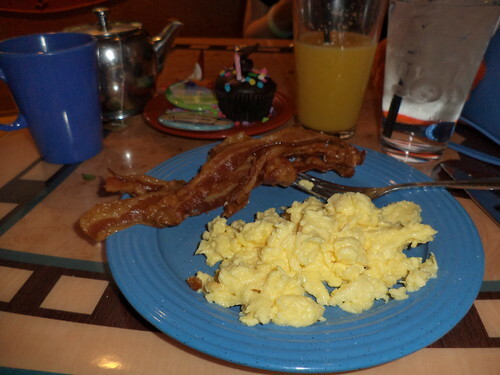 Fluffy, fluffy scrambled eggs and crispy bacon. Tea and orange juice in abundance. When we walked in and had our photos taken with Goofy, we were asked if we were celebrating anything. We said, "First visit" and then pointed at Ashley. "Her birthday is Saturday," we said. Liz and Ashley looked at me. "Well, your birthday is close." "Not really. It's Thanksgiving Day. That's not close." The employee shrugged. "Two birthdays! That works!" Mid-way through breakfast, this arrived, along with wait staff to sing to us. They set fire to my dessert and sang about it. I got a "First Visit" and "Birthday" button. I put my World of Warcraft name on the button. 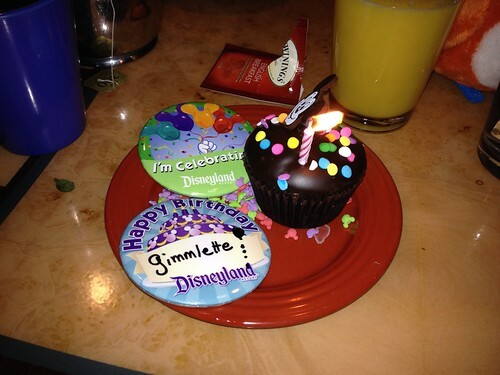 On Sunday, when we came back to the parks, I did not wear my birthday button. It was the day after Ashley's birthday and I wanted her to have all the good wishes. Maybe some day I'll go back. Sounds like you have been quite busy this Fall. Moving your office,travel inspections and some vacation. Hope you had a chance to enjoy the holidays and relax with the cats.